The United States Mint recently provided the finalized mintage figure for 2009-dated American Silver Eagle bullion coins. The final mintage marks a new record for the one ounce silver bullion coins. Throughout the year, the US Mint provides ongoing updates of the calendar year bullion sales figures. Monthly summaries of this information can be found in the precious metals sales reports section. The sales figures and corresponding annual total represent the number of coins sold during the year, without respect to the date which appears on the coins. Therefore this information does not indicate the mintage for each year’s bullion coin. The previously reported 2009 annual sales total was 28,766,500. The final mintage for 2009 Silver Eagles comes in higher at 30,459,000. This sets a new mintage record for American Silver Eagles, surpassing the previous record of 20,583,000 recorded for 2008-dated coins. Until 2008, the record mintage had stood at 11,442,335 for more than two decades. This mintage was achieved for the 1987 Silver Eagle, which represented the first full year of sales for the bullion coins. The coins had been introduced in the prior year, but were only available for the last few months. Elevated sales levels for the American Silver Eagle have continued into 2010, but will demand (and planchet supplies) be high enough for another record breaking year? So far during 2010, the US Mint has sold 6,817,500 American Eagles. Of this amount 367,500 coins are known to be dated 2009, with the rest presumably representing 2010 Silver Eagles. That’s funny. I thought that by law, the U.S. mint cannot mint post-dated coins!!! 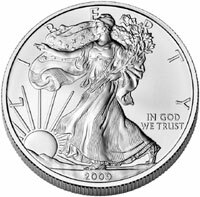 The article above indicates that thus far in 2010, the Mint has sold 6,817,500 American Silver eagles and of this amount, 367,500 are known to be dated 2009. Am I missing something??? The 367,500 coins dated 2009 were the remaining inventory of coins from the prior year, i.e. they were struck during 2009, but sold in 2010.